Many of my friends asked me that, some times they cannot enter into some system folders and files of Windows XP, 7. When they to enter into those folders, an error or security message prompt is shows like “This folder access is denied” or “You cannot access this folder due to security reasons”or “Location is unavailable”. Why it happens? Because actually there is an another hidden administrator on your windows system which is called “System Administrator”. System administrator always try to protect your windows from being unauthorized access. 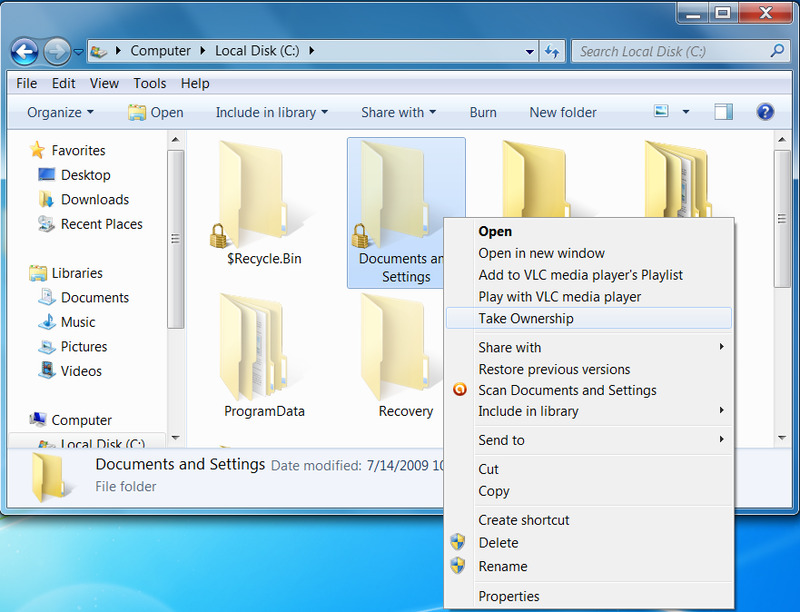 Now you have to do a little hack(trick) to access any protected folder or file and take control over it. It’s not a crack. You have to make changes to the registry settings to get the administrative power to browse system folders and open protected files. Editing registry manually is not suitable for all jobs on windows computer. Some times it is risky and also confusing. So you have to use a specific registry editor reg file to edit registry settings to take access on folders and files. TakeOwnerShip.reg is the most famous and safe registry editor to take control over protected files and folders. Now let’s take a tour of this job. 1. Now I will try to enter into a protected ‘Documents and Settings’ folder without taking control or editing registry. So it will show an error message. 3. Enter into the zip package and you will see two registry editor file. One is InstallTakeOwnership.reg and another is RemoveTakeOwnership.reg. 4. Now click on InstallTakeOwnership.reg file and you will be prompt with a security message as below. 5. Click on yes to edit registry settings. And ok.
t to enter. And right-click on the folder. select takeownership to take control. 7. In the right-click menu you will see a new entry ” Take OwnerShip”. Select it. 8. After selecting Take Ownership, you will be prompted with a security message. Select yes to proceed. 9. Now you will see a running windows dos command window as below, which is granting your access. 10. After finishing this automatic dos command prompt, you will have access to enter into that folder. 11. For example, I have now power to enter into ‘Documents and Settings ‘ folder. 12. Do the same for other folders and files to bypass system security check. Don’t forget to leave comments to share your opinion about this article. Thanks. very good web good info congrats. very good page good info congrats. thank you so much for this. i had to take care of a virus file and it was denying my access even as an administrator, but this exe let me access and delete it permanently. works perfectly. Works for me ! Rijans you rock, man!! i’m a gamer and i know great program when i see one. This is brilliant..definitely recommend it to anyone. 2 THUMBS UP!! All I can say is AWESOME! In only a few minutes, was able to crack into a Windows Vista user folder on a laptop hard drive that lost ability to boot which I slaved to a Windows 7 (64bit) machine via USB. Seriously amazing. Congrats Jaber! This is something many of us need. I know the idea of taking over the ownership but I do it the hard way (manual method). I aptcariepe you taking to time to contribute That’s very helpful.